Real property can be transferred with an instrument in writing, which can be a grant, bill of sale, or a conveyance. 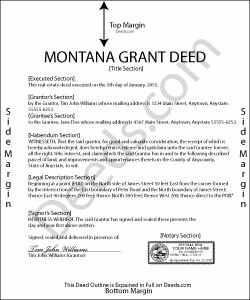 A grant deed can be used in Montana to transfer title to real property. The Montana Code Annotated provides a general form for conveyances that can be used for a grant deed in this state (70-20-103). A grant deed includes covenants that the grantor has not conveyed the same property to any person other than the grantor and that the estate is free from any encumbrances done, made, or suffered by the grantor. A transfer of real property in Montana will pass all the easements attached to the property and will create in favor thereof an easement to use other real property of the person whose estate is transferred in the same manner and to the same extent as such property was obviously and permanently used by the person whose estate is transferred for the benefit thereof at the time the transfer was agreed upon or completed (70-20-308). In order to have a grant deed recorded in Montana, it must be in writing, signed by the grantor or the grantor's lawful agent authorized in writing, and acknowledged or proved. The execution of the deed must be acknowledged as defined in 1-5-602 of the Montana Code Annotated or proved by a subscribing witness, which also must be notarized (70-21-203). Grant deeds can be acknowledged in other states in accordance with MAC 1-5-606, and they will be valid for recordation in Montana. A Realty Transfer Certificate must accompany all applicable grant deeds when they are presented for recording (15-7-305). All real estate deeds, including grant deeds, should be recorded in the county where the property is located in order to provide constructive notice of the contents thereof to subsequent purchasers and mortgagees (70-21-302). If the property is located in more than one county and the deed has been recorded in either of such counties, a certified copy of the deed can be recorded in the other county where the rest of the property is located (70-21-201). If a grant deed is not recorded, it will be valid only between the parties to it and those who have notice thereof (70-21-102). Additionally, the deed will be void against any subsequent purchaser or encumbrancer of the same real property or part thereof in good faith and for a valuable consideration whose conveyance is first duly recorded (70-21-304). A deed will take effect so as to vest the interest intended to be transferred only upon the grantor's delivery of it (70-1-508).